City of Persia; capital of the province of Fars. It was founded by Mohammed, brother of Al-Ḥajjaj, in the year 74 of the Hegira (= 693 C.E.). According to traditions current in Persia, Jews settled at Shiraz at an early period, but the exact date is not known. In the twelfth century there were, according to Benjamin of Tudela ("Itinerary," ed. Asher, i. 82), 10,000 Jews in the city. Chardin, who visited Shiraz in the second half of the seventeenth century, says ("Voyages en Perse," pp. 446-447) that the Jews there were employed in the manufacture of wine for European companies which had bought the privilege of wine-making. He adds that the Jews, in common with the other non-Islamic inhabitants, enjoyed religious liberty. Nevertheless, as is shown by the poems of Babai (Hebrew MS. No. 1356, in the Bibliothèque Nationale, Paris), the Jews of Shiraz have always suffered under the same persecutions as the Jewish inhabitants of other Persian towns, particularly in thebeginning of the eighteenth century under the first kings of the Afghan dynasty. 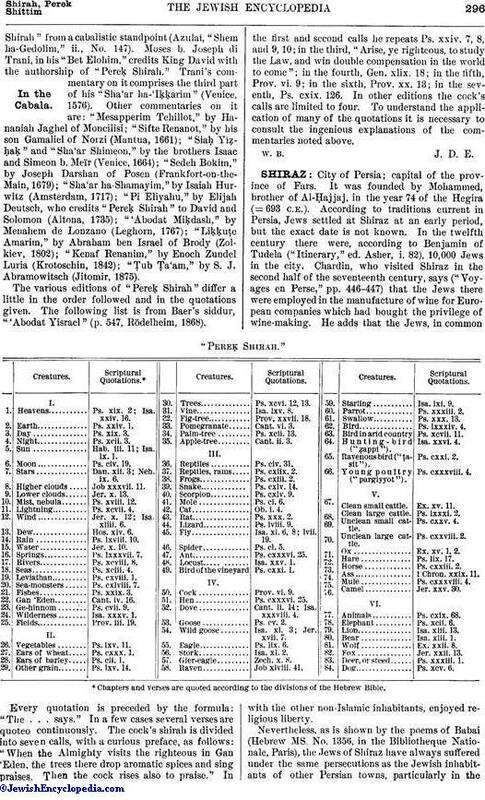 In the nineteenth century most of the Jews of Shiraz were gold-workers or storekeepers; and their number was estimated in 1807-9 by Dupré ("Voyage en Perse," ii. 9, Paris, 1819) at 400 families. In 1850 Benjamin II. found at Shiraz 500 Jews and nine synagogues, the chief rabbi-being Mulley Israel. 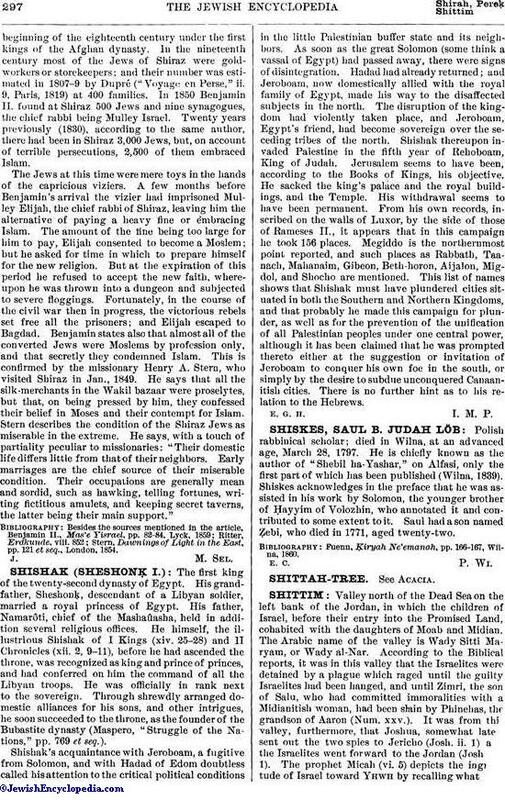 Twenty years previously (1830), according to the same author, there had been in Shiraz 3,000 Jews, but, on account of terrible persecutions, 2,500 of them embraced Islam. The Jews at this time were mere toys in the hands of the capricious viziers. A few months before Benjamin's arrival the vizier had imprisoned Mulley Elijah, the chief rabbi of Shiraz, leaving him the alternative of paying a heavy fine or embracing Islam. The amount of the fine being too large for him to pay, Elijah consented to become a Moslem; but he asked for time in which to prepare himself for the new religion. But at the expiration of this period he refused to accept the new faith, whereupon he was thrown into a dungeon and subjected to severe floggings. Fortunately, in the course of the civil war then in progress, the victorious rebels set free all the prisoners; and Elijah escaped to Bagdad. Benjamin states also that almost all of the converted Jews were Moslems by profession only, and that secretly they condemned Islam. This is confirmed by the missionary Henry A. Stern, who visited Shiraz in Jan., 1849. He says that all the silk-merchants in the Wakil bazaar were proselytes, but that, on being pressed by him, they confessed their belief in Moses and their contempt for Islam. Stern describes the condition of the Shiraz Jews as miserable in the extreme. He says, with a touch of partiality peculiar to missionaries: "Their domestic life differs little from that of their neighbors. Early marriages are the chief source of their miserable condition. Their occupations are generally mean and sordid, such as hawking, telling fortunes, writing fictitious amulets, and keeping secret taverns, the latter being their main support." Stern, Dawnings of Light in the East, pp. 121 et seq., London, 1854.